Coach Matt Furjanic Inducted into Florida College System Activities Association (FCSAA) Hall of Fame. 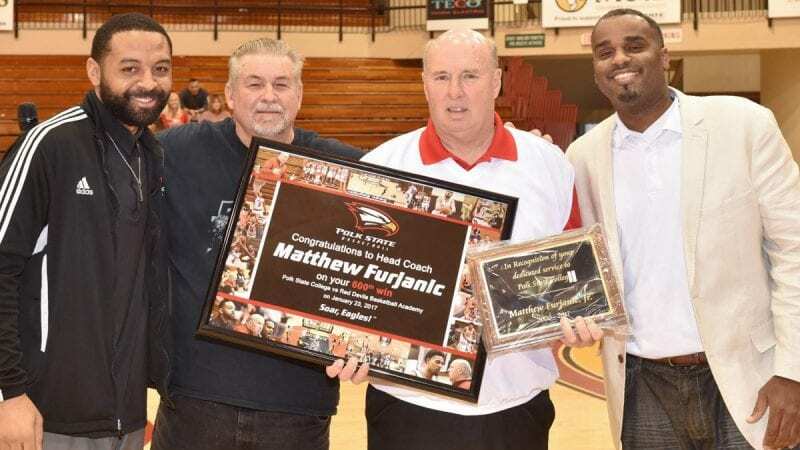 As the epitome of teamwork, loyalty, and Polk State pride, it comes as no surprise that Coach Matt Furjanic would be inducted into the Florida College System Activities Association (FCSAA) Hall of Fame. Furjanic, in his 17th year as head coach of the Polk State basketball program, has amassed an overall record of 309-192, which includes six Suncoast Conference titles (2013, 2011, 2009, 2008, 2004, and 2003), three Suncoast Conference tournament titles, and six Suncoast Conference Coach of the Year awards. Sixty players have gone on to earn scholarships at four-year institutions during Furjanic’s tenure. Polk State is one of only two teams in Florida to qualify for the National Junior College Athletic Association (NJCAA) Region 8 tournament in seven of the past nine years. For Furjanic, this has been one of his greatest accomplishments. Members of the Hall of Fame have made outstanding contributions as coaches, players, officials, administrators or contributors. Coaches must have been actively involved in coaching at an FCSAA-member college for a minimum of five years or won an NJCAA Championship. Additionally, the FCSAA Hall of Fame recognizes individuals who have made a significant contribution in all co-curricular activities, including athletics. Furjanic is one of four inductees who will be recognized during the men’s semifinal round at the FCSAA Tournament on Friday, March 10 at the College of Central Florida in Ocala.